Investors in Russia are set to reflect positive news of recent days Wednesday, as the country enjoyed a three-day break for Russia Day. Globally, stocks are set to weigh up May figures and the potential impact of Sunday elections in Greece. Global investors will get enough data to reflect on Wednesday. Germany is set to release its final reading for the May Consumer Price Index, with analysts largely expecting that to replicate the preliminary data – a 0.2% month-to-month drop. Also, in midday, April data on eurozone industrial production will come out, with market players expecting the contraction to intensify – from a 0.3% month to month drop to a 1% decline. The US producer price index for May, as well as monthly retail sales data, will also be driving the floors. Closer to the end of Russian trading, at 18:30 Moscow time, the Energy Information Agency will show the dynamics of the US oil and petrol stocks during the past week. Oil was down, which came in the wake of Thursday OPEC ministerial meeting in Vienna to discuss production quotas. This could become a showdown between Saudi Arabia and Iran over how much oil the organization is producing. New York's main contract, light sweet crude for delivery in July, sank 68 cents to $82.64/bbl and Brent North Sea crude for July delivery fell 28 cents to $96.86/bbl. Saudi Arabia, OPEC's biggest producer, has raised output to almost 10 million barrels a day in an effort to push Brent down toward $100 per barrel, a level the Saudis believe the global economy can tolerate. Iran wants a higher price because its oil exports have been curtailed by Western sanctions imposed because of a dispute over its nuclear program. The oil markets were also under pressure from growing worries over the economic crisis in Europe despite a massive bailout package of 100 billion euro ($125 billion) to rescue Spain's ailing banking sector, economists say. Asian stocks drifted mostly lower on Wednesday, as persistent worries over European policymakers' ability to contain the continent's simmering debt crisis outweighed a big US rally. Japan's Nikkei 225 index gained 0.3% to 8,565.15 but South Korea's Kospi dropped 0.1% to 1,852.87. Hong Kong's Hang Seng was nearly unchanged at 18,886.45. Australia's S&P/ASX 200 fell 0.4% to 4,058.30. Benchmarks in New Zealand and Singapore fell. Taiwan and mainland China's Shanghai Composite Index rose slightly. 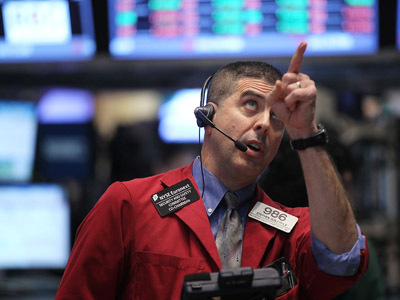 Some markets saw a small bounce in early Tuesday trading following a US rally on comments by Charles Evans, president of the Fed's Chicago bank, who told Bloomberg News he supported action to produce faster job growth. This helped the US stage one of their strongest rallies of the year. The Dow rose 1.3% to close at 12,573.80. The Standard & Poor's 500 index gained 1.2% to 1,324.18, and the Nasdaq composite rose 1.2% to 2,843.07. Anyway, investor optimism soon faded. Investors are still wary about the situation in Europe. 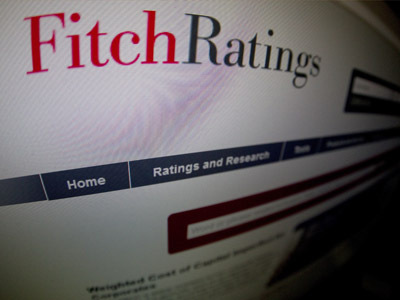 In Spain, ratings agency Fitch downgraded 18 banks and benchmark borrowing hit its highest level since the country adopted the euro currency. Spanish 10-year bonds hit the record of 6.8%, which points to huge investor concern over the safety of Spain’s sovereign debt. At 7%, economists say, countries generally can no longer finance their own debt. Borrowing costs for Italy, which analysts fear will be the next European country to seek some kind of rescue, rose even more. They jumped 0.47 of a percentage point to 6.02%. In Greece, investors are nervously looking ahead to an election on Sunday to see if a party that has vowed to throw out the country's bailout agreement will win. 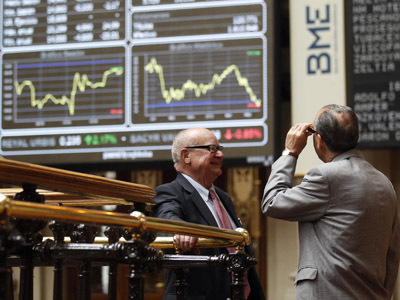 Stocks slipped early in Madrid, then turned positive and were up 0.1% after US markets opened. 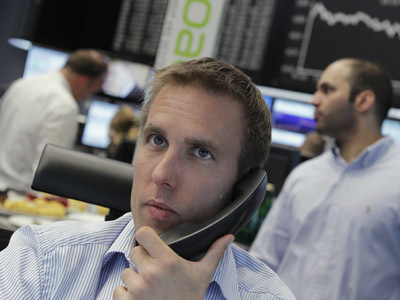 France's CAC-40 rose 0.1%, and Germany's DAX gained 0.3%. Russian stocks finished Saturday trading in the black. The RTS added 1.13% to end at 1, 296.93, with the MICEX was up 0.39% to 1, 338.07.